In all the hubbub of the overtime Kansas legislative session, the obvious solution to crippling state financial problems gets little traction. In fact, the governor threatens a veto if it would pass. Why not undo the tax policy that created the problem? Steep income tax cuts directly caused a massive revenue loss — $700 million in one year. Before embarking on the infamous fiscal experiment in 2012, Kansas had a stable tax system that most people considered fair. If tax policy had been left alone, our state sales tax rate would now be 5.7 percent instead of 6.15 percent, and the state could easily pay expenses with adequate reserves left at the end of the year. Our state highway fund would be healthy, our bond rating up, and the legislative session long over. Kansans hold contradictory notions. If given a choice, we prefer not to pay taxes. Yet we value good services — smooth roads, high-quality education, a social safety net — things that cost money. We are not unusual in that outlook. It’s normal. Human nature. Our governor and lawmakers must find a reasonable, fiscally responsible balance between those competing desires. That’s their key task in every legislative session. For example, going on a spending spree without regard to available resources takes the state out of balance and upsets the citizenry. Likewise, a tax-cutting binge that fails to account for the costs of basic services and bills that must be paid also unhinges the system. In Kansas, we currently suffer from the latter irresponsible affliction. Income tax cuts that disproportionally benefit the wealthiest Kansans have destabilized state finances. What happens when income tax rates are cut, and many businesses are entirely exempted from paying? Revenue goes down! That should not come as a surprise, but it appears to have stunned the governor and many Kansas lawmakers. For two years they have tried to tell us everything is fine while they used up the state’s savings account and raided the highway fund to cover up the now-massive budget problem that the income tax cuts have created. But it’s no surprise any more. Reality has arrived. The state budget imbalance has become so serious that either taxes have to go up sharply or spending on education and other state programs must drop to an unacceptably damaging level. What to do? Lawmakers don’t know. They are mired in the longest legislative session in state history. The governor and legislative leaders have dithered and weakly allowed the budget process to drift into chaos. Many proposals have been flying. More tax on cigarettes and gasoline. Higher property tax. Raise the sales tax rate to one of the highest in the nation. Eliminate the sales tax exemption on Girl Scout cookies. One proposal would even have the government tax its own purchases, though exactly how that could realistically raise money is unclear. 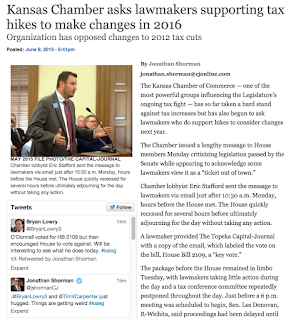 Instead of doing the obvious thing, lawmakers have been whacking away at programs and trying to add taxes that hit average working Kansans the hardest. Raising regressive taxes to cover up a past mistake isn’t going to be popular. Most Kansans would rather not pay any taxes, but are willing to pay for quality services if the system is fair. Kansans know by now that forking over higher sales and property taxes or enduring service cuts to pay for a failed policy experiment doesn’t pass muster.